Language Arts Essentials 1 Edition This new book from the leading name in literacy and language arts has been crafted to provide concise, critical information for teaching the language arts, backed by the most current and applicable research available. The “essentials” format gives teachers the information they need in a price- and time-conscious way. Language Arts Essentials will provide inservice teachers with the needed background information and strategies as they further their professional development. 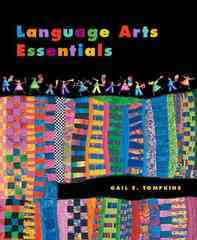 Written by leading Language Arts author Gail Tompkins, this book is: Concise, research driven, critical information for the language arts. Very Applied - The book is divided into six parts, with each part covering the essentials, strategies, and classroom practices appropriate to the topic. A BRAND NEW BOOK - not just chapters of her big book. Written from the ground up to be an essentials book.